I have promised to supply Harriett with more family photos. Here's a few to start. First the three conspirators in this project. Then some of Stan's sister Joan Ruby Felenstein Myers. Joanne, Walt and Dan at Jo's house in January 2009 celebrating Walt's birthday. 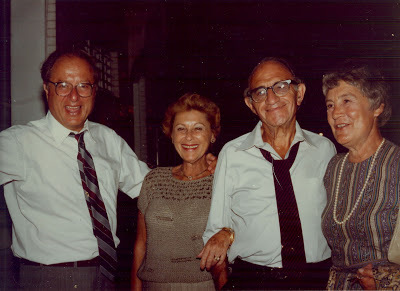 At Joanne's wedding in Chicago in 1983: Joan and Ruby Myers are flanked by the bride's happy parents. 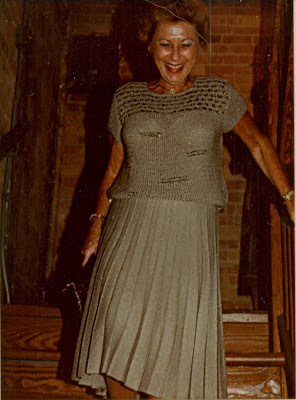 Joan descends the staircase at the loft apartment where the wedding was held. Combined 75th birthday celebration for Stan and Helga, held at mountain winery in Saratoga CA in 1999. 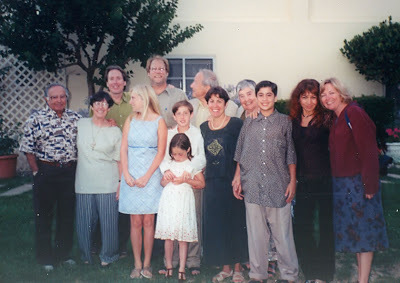 From left: Mel Brenner, Sandy Brenner, Bill Rehm, Twyla Ruby, Dan Ruby, Lani Rehm, Zach Rehm, Stan Ruby, Joanne Ruby, Helga Ruby, Gene Ruby, Ludmilla Ilishaev, Kate Eilertsen. Walter was out of the country and could not attend.